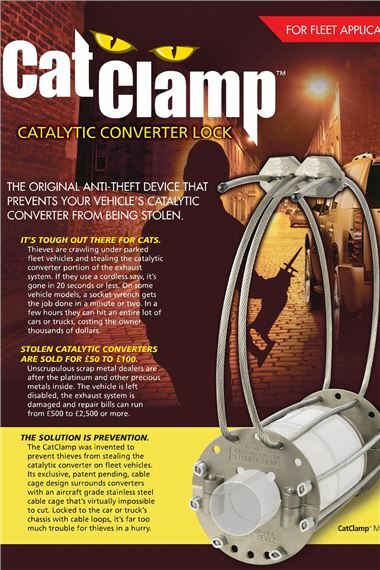 Retainagroup and Cat Clamp have developed a system to protect catalytic converters against theft from vans and other vehicles and make them easier to recover if they are stolen. The firms say that the combination of the precision-made clamp and Retainagroup's highly visible, secure marking and registration system presents a formidable challenge to criminals. In future, each stainless steel clamp will have a special label that can't be removed without leaving evidence. There is also a fluid to permanently etch a Retainagroup unique code and telephone number of the company's secure database, the International Security Register into each catalytic converter. This offers immediate identification if a theft occurs. According to Catclamp, during recent weeks there has been a marked increase in catalytic converter theft. As a result, Guildford Council and Kent County Council have taken the decision to protect their entire fleets with the clamp and with the Retainagroup marking and registration system. It seems that in many cases vehicles have been targeted not just once but at least 2-3 times in succession at a cost of many thousands of pounds each time. Councils protecting their vehicles in this way is good news for elderly and disabled people who rely upon the various daily transport services provided. If vehicles have to be off the road due to damage caused by thieves removing a cat, this can mean people being confined to their homes for days on end.